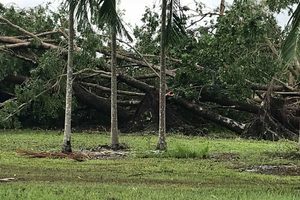 Category 5 cyclones aren’t the standard by which course improvement strategies are often based on but the wrath from the heavens that Marcus inflicted on the Palmerston layout in March is shaping as a blessing in disguise moving forward. That's the opinion of Scott Trembath of Top End Green Keeping, the course superintendent charged with preparing the golf course of the 2018 MMC Northern Territory PGA Championship. Trembath was lured to the club last October by former General Manager Noel Fahey with a brief to provide better playing surfaces for club members and of course, the Championship in August. A veteran of more than a dozen seasons in the Top End, Trembath and his team’s plans naturally include strategies to prepare courses for the extremes of wet and dry seasons each year. Cyclones ‘happen’ but not annually or to the extent that Marcus quickly developed into. “This one brewed up pretty much out of nothing. On the Friday afternoon we’d hardly tidied up around the shed as it didn’t look like it would do much here. By Saturday morning, everything had been blown apart.” Trembath said. “The shade issues they created on tees and greens were so bad but they’re in full sunlight now with the trees missing. We would never have had the capacity or the resources to remove that many trees as part of a planned strategy." Image: Cyclone Marcus' devastation is painfully obvious the following day. Trembath praised club management for taking immediate steps to start the enormous clean up task that involved as many hands on deck as was humanly possible. The course's presentation during the championship belied the many cranes, trucks, chainsaws, huge mulching machines and hundreds of hours of grunt from many staff and volunteers that had been furiously busy over a few short months to present the golf course for play. 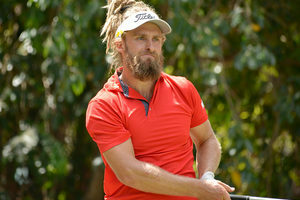 On his arrival last year, Trembath quickly turned his attention to solving the conundrum of the 'patchy' putting surfaces, which had not responded as expected to the maintenance methods that had been tried and tested in similar conditions at other golf courses across the Northern Territory. 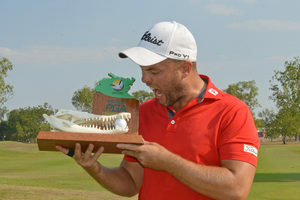 The product of the green staff’s toils survived the ultimate litmus test, Tour player satisfaction during the Championship. To a man, the feedback has been positive especially from those players who have now played at Palmerston over a number of years. If future plans to upgrade fairway irrigation systems eventuate as anticipated, that will only serve to elevate the standards of the playing corridors from tee to green and free up Trembath and his team to focus time elsewhere on course maintenance activities. Soil without nutrient, a metre of rain in January, another half metre in February, a major cyclone in March - demanding a massive cleanup and subsequent reconstruction of some greens and tees - and barely a drop of rain since. Surely no other ISPS HANDA PGA Tour of Australasia venue has had to face challenges of this magnitude as part of their course preparations five months out from an event? Just a ‘standard’ wet season is surely the kind of break Trembath, Palmerston members and staff are overdue in the months ahead. Please.